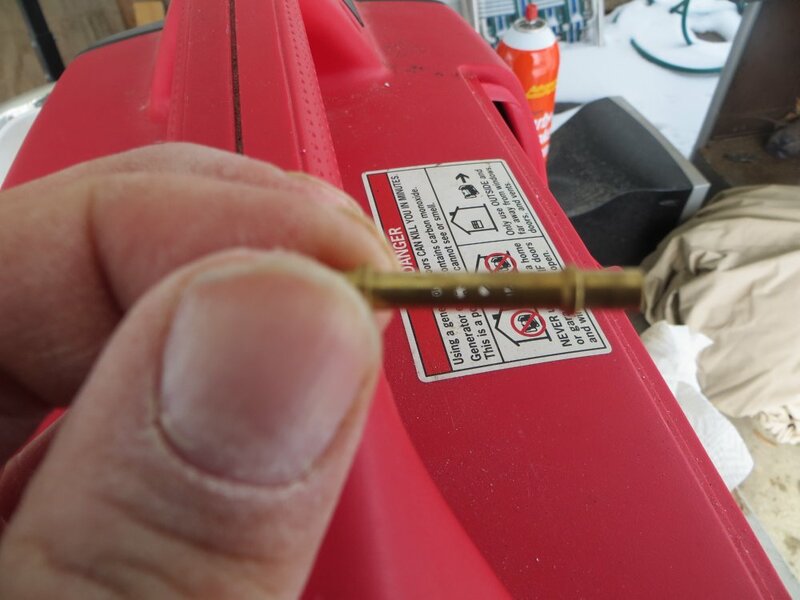 It’s surprisingly easy to clean the emulsion tube on your Honda EU2000i generator! 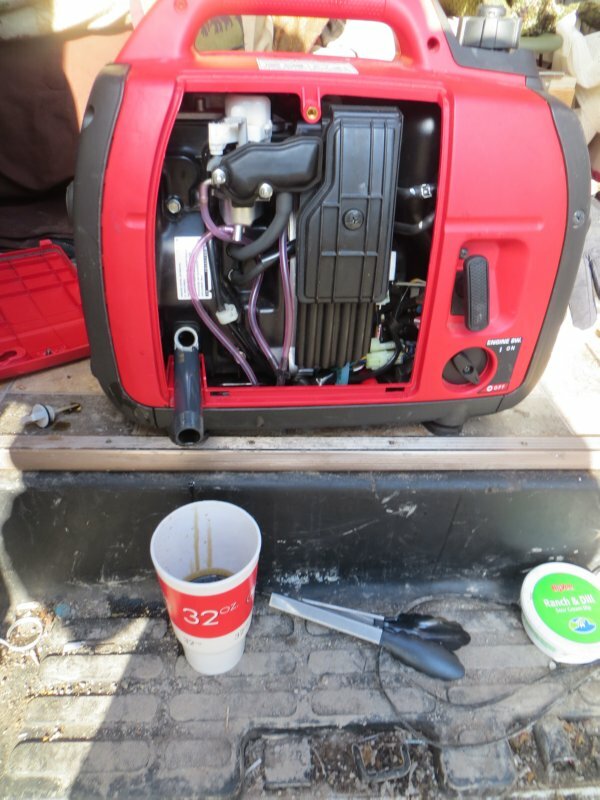 The Honda EU2000i is one of the most popular generators used by camping enthusiasts. It costs about $1000 – $1149, is very quiet, starts easily, and sips gas. The Honda is extremely reliable but does require some maintenance, particularly if you don’t run fresh fuel in it. I made that mistake last summer, snitching some of Dad’s very old lawnmower gas. The generator never ran quite right since then… The engine was surging… a sign that the tiny holes in the carburetor’s emulsion tube were possibly plugged. Also, I had never changed the oil in the Honda and from the looks of the oil, it was about time. Even with only thirty hours on the Honda, you still need to keep the oil clean since there is no filter to remove particulate. For what the genny cost, it’s well worth a 1/2 quart of 10W30 to keep the motor from seeing excessive wear. 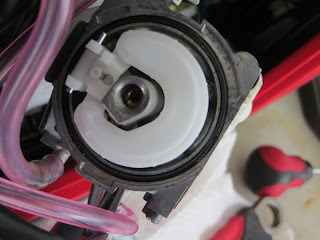 The purpose of this post is to briefly illustrate how easy it is to change your oil and clean the carburetor’s emulsion tube. You can do both in an hour… or less! Changing oil can be messy. There are commercial oil change adapters available for $15-$20 that might help. They thread nicely into the dipstick hole and make the job spill free. But they also cost money. A much cheaper adapter can be fashioned out of a little piece of PVC pipe like you see here. That way you can tilt the generator over, let the oil run down the little spout, and drain it into whatever container you desire. Then, just use a funnel to put the new oil back in. It’s that easy. No, the tube was not my idea. I found some videos on the Internet for changing the oil. Just make sure and use a good quality oil. The Honda manual recommends using SJ rated 10W30 oil. I am using Castrol. How often do I plan to change it? About every 30 to 40 hours. Remember, there is no oil filter to catch particulate. The longer you go between oil changes, the better the chances you are wearing down engine parts by circulating tiny metal shavings. Cleaning the carburetor was a relatively simple job. If time and the weather allow, you can do the job right, carefully disconnecting each part and scrubbing out corrosion and gunk. I chose sort of a “lite” version, removing the minimum amount of hardware and hoses, carefully moving each part out of the way, and cleaning the problematic emulsion tube. The carburetor sits on two studs behind the air cleaner assembly. 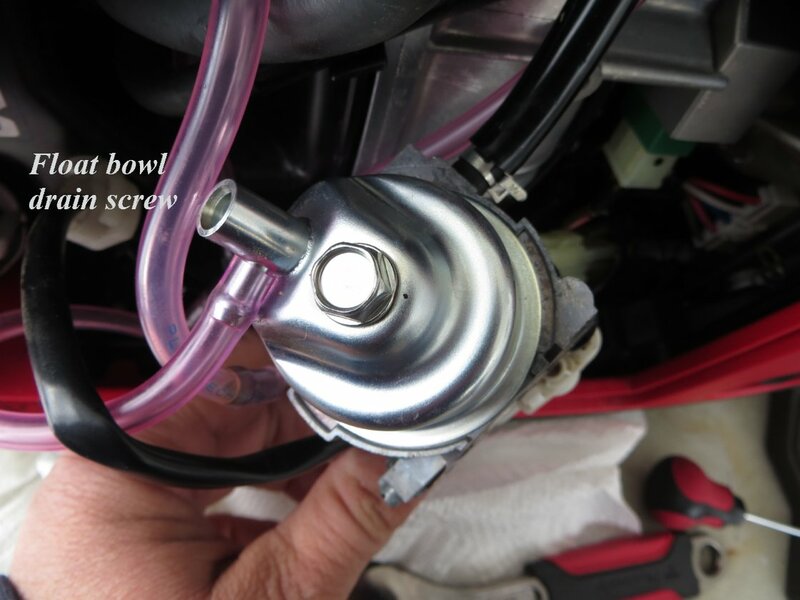 To access it, first undo the large screw that secures the air cleaner cover. Remove the filter and coarse “Brillo pad” piece below it. 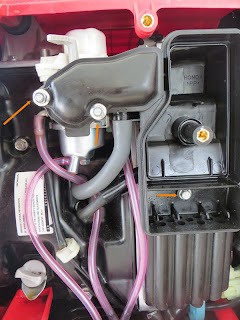 Next, undo the bolt (lower orange arrow) as well as the two retaining nuts (the left most two orange arrows). I carefully set the hardware far enough away that it couldn’t get knocked on the ground. Disconnect the large rubber hose (next to the middle bolt/ arrow). Remove the air cleaner plastic assembly and set aside. Now the carburetor will slide off the studs. Be careful not to lose the paper gaskets. Turn the carburetor upside down. Here is the carburetor upside down. After draining the float bowl of any remaining gas (and replacing the screw), undo the large bolt in the middle to take the float cover off. Here is the bottom of the carburetor with the flat bowl removed. Note the rubber o-ring. It can be reused numerous times. The white doughnut shape is the float. What we are looking for is the screw in the center. Carefully undo it and remove the parts that come out, being careful to keep them in the same order and orientation. Like I said, this is the “lite” version. I didn’t bother to take out the float itself, rather opting to spray some cleaner inside the area and concentrate on the tube. The photo above shows the emulsion tube parts laid out on the air cleaner… Don’t sweat it if you can’t remember the order. The slot of the screw goes to the outside. The emulsion tube has a flare on one side. 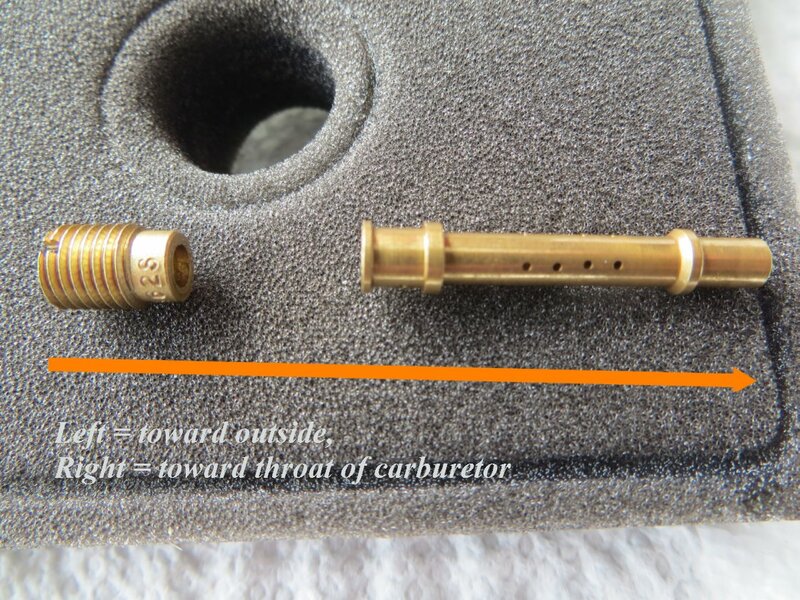 It’s the skinny part that goes toward the inside of the carburetor. 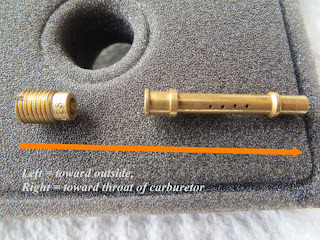 Clean the tube well with carburetor cleaner and make sure the little pinholes are clean enough to see daylight (as in the opening picture). You can use a single strand of 16 gauge wire. A mechanic friend told me he uses the wire tie from a bread wrapper – with the paper removed. Putting the generator back together is easy. It’s just a reverse application of what you previously did. Put the emulsion tube back in and tighten the screw until just barely snug. The float bowl goes back on next. Re-seat the carburetor on the studs, making sure the original gaskets are still in place. Reattach any hoses and the air filter cover. Cleaning the tiny holes on the emulsion tube made the Honda run like new. It was well worth the effort. Next year the generator will get a more thorough cleaning job… but for now, it’s doing just fine. Thanks for visiting. As always, I appreciate your comments. Take care! Tagged EU2000i, generator, Honda. Bookmark the permalink. Two questions. Would you say that just like in a new car, it is advisable to change the oil after only a little use, but not so often once it’s broken in? I think on a new car it’s usually recommended that the first oil change is done after the first 500-1000 miles. I realize you plan on doing it every thirty hours, so how long would you say, roughly, that it takes you to run it for 30 hours? I know you have supplemental energy from solar and stuff. Second (lol, I think this might actually be like the third question) how often does Honda recommend oil changes and other maintenence? I should have mentioned the Honda recommended intervals. The first recommended change was at the 20 hour point (like the new car break-in oil change). Honda says to change the oil by each 100 hour mark after that. My usage is low – I’m predicting less than 50 hours all year (thanks to solar) and campground shore power. In actuality, it will be more like an annual oil change.